Around 1830, John Spencer received a deed from the United States government for a large tract of land, containing what is now downtown Rock Island. He then built a log cabin for his family just south of what is now 6th Avenue and 19th Street. The Spencer family was Methodist, so as new Methodists arrived to settle here, he invited them to hold services at his home. John was generous with his land as well as his home, and he soon donated a full square block downtown dedicated to public use. His original intent was that a schoolhouse be erected in the center surrounded by churches on its four corners. In 1843, the First Methodist Episcopal congregation built their new brick church on the northwest corner of the square, at Second Avenue and 19th Street. That church, which was called “plain and lacking ornamentation,” contained only simple board benches. But it sufficed. In 1854, as prosperity was riding in on a brand new railroad, city fathers wanted to make a park of John Spencer’s downtown block. The Methodists were urged to sell their church to the city and build their new one in “beautiful Spencer Grove.” They agreed, and Spencer Grove, on the corner of 19th Street and 5th Avenue became the site for their second brick church. This church, known as the Fifth Avenue Methodist church, would have looked at home in New England, with its simple rectangular style, an elevated basement and bell tower beneath tall tapering steeple. In 1869, a very special bell was added to that bell tower. It was a Holbrook bell, made by the Holbrook Bell Foundry of East Medway, Massachusetts. The company, which had been founded in 1797, remained in the ownership of the Holbrook family until 1880. The bells they produced were noted for their “pure and musical tones and extraordinary vibrations.” In 1879, the name of Fifth Avenue Methodist would be changed to simply First Methodist. 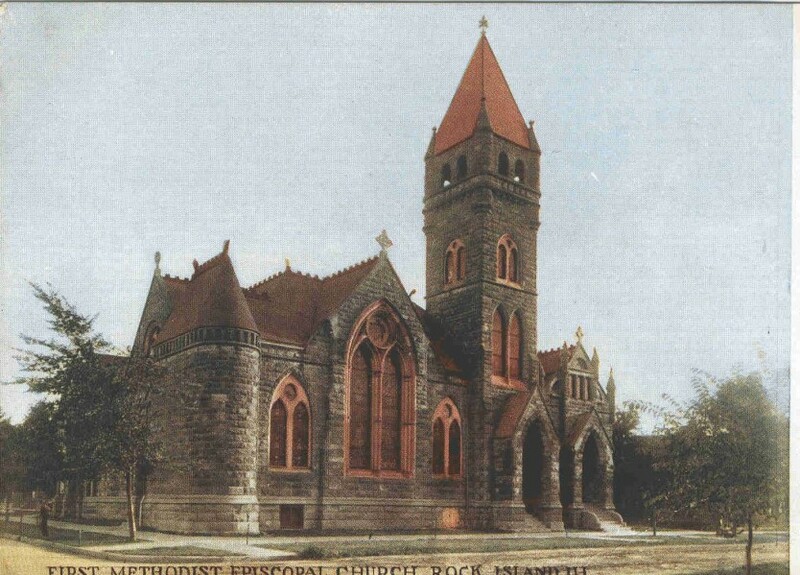 In the late 1880s, the cherished Holbrook bell would be moved to a new church, the one pictured on this postcard, which is identified as the First Methodist Episcopal Church. That name would be returned to First Methodist Church in 1939. By 1968 there was yet another name, its current one: First United Methodist Church. The pictured church was built on the same 5th Avenue site as the earlier church, and was designed by architect D. S. Schureman. Mr. Schureman had recently moved to Rock Island from Cincinnati, where he had designed its First Baptist church. His original plans called for the church to be built of a “purplish gray stone composed of siliceous iron and mica,” which would be mined from a new quarry by Black Hawk’s Watch Tower. According to Augustana geologist Dr. Richard Anderson, this probably referred to a band of stone in the Searstown bluff, just south of what is now the Hillside Inn. Perhaps not enough stone was easily accessible for this huge church, because ultimately the walls were made of Colona sandstone, with “tracings and trimmings” of Berea (Kentucky) stone and a basement of blue Bedford stone. One account says that stone came from seven quarries in five states. 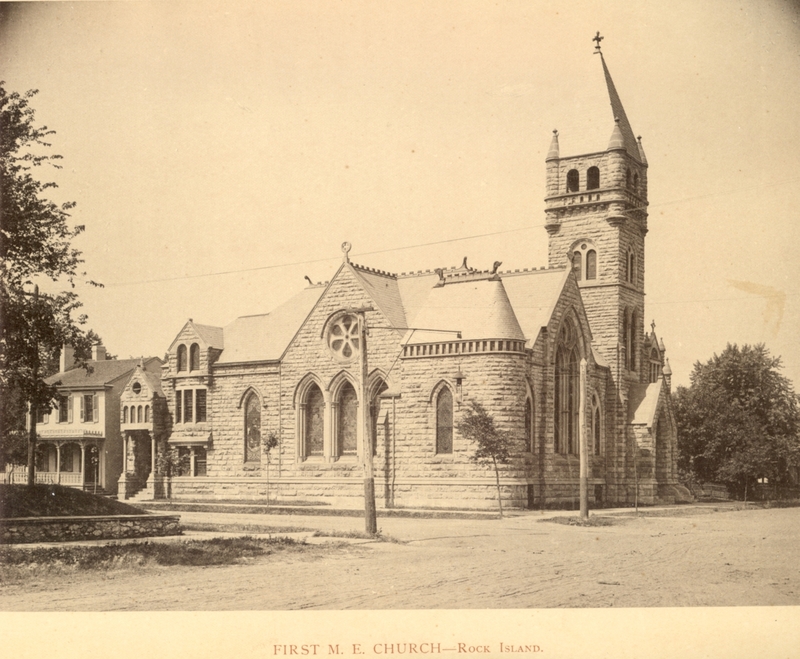 The cornerstone for the church was laid in September of 1889 and its dedication was October 26, 1890. A photograph published in 1893 shows the church at that time. Comparing this photo and the postcard view to the church today, shows no change in its appearance. Yet alterations and additions have been ongoing since the earliest days. In 1896, the installation of a pipe organ, a gift from Captain Robinson, who was married to Julia Spencer, required interior changes, especially to the balcony and the pastor’s study. Descendants of the Spencer family had already donated three stained glass memorial windows, that had been made in Philadelphia, honoring their pioneer forbears. Later additions have been made to the south and the west. The large south annex, designed by local architect Olof Cervin and completed in 1915, contains many classrooms and a kitchen, as well as a large auditorium. Beginning in 1958, several years of construction were undertaken to rearrange the interior spaces, changing the sanctuary from a curved Akron style to a rectangular one with center and side aisles leading to the altar at the south end. A new rose window was installed above the altar, and three interior stained glass windows were donated by local families as memorial gifts. In 1967 a new accessible entrance on the west side completed the construction. The church also undertook an unplanned construction in 1975 after the steeple was struck by lightning and destroyed. The damaged timbers were first removed down to the level of the stone tower. Then a new steeple top was built on the ground and lifted with a crane, carefully coming to rest on the waiting tower. It is indistinguishable from the original, with only the addition of a lighted cross. The Rock Island Preservation Society recognized the congregation’s outstanding act of preservation by awarding them one of the very first Preservation Awards. The Holbrook bell still hangs in the restored steeple. Alas, its cradle is fragile enough that it cannot be rung without possible damage. But surely a day will come when this pure and musical bell with its extraordinary vibrations will once again peal out over our valley. This article by Diane Oestreich is slightly modified from the original, which appeared in the Rock Island Argus and Moline Dispatch on November 24, 2002.